Gartner as part of its annual exercise has released Hype cycle for Emerging Technologies 2016. It been over two decades now that Gartner has been coming out with this study. Analytics India Magazine reviewed the study and brings its readers the Hits and Misses by Gartner’s Hype cycle for Emerging Technologies 2016. For our readers who are unfamiliar with this study, Gartner reviews more than 2000 technologies to select the relevant ones for their study. Then all these technologies are rated by Gartner and placed on the hype curve which reflects the phases that each technology would take from the development stage to being market–ready. Also each emerging technology is applied with a symbol which is indicative of the estimated time frame required for significant market penetration. In this study Gartner has plotted the emerging technologies by using parameters, Expectations and Time on Y and X axis respectively. The time period is divided in to 5 phases as illustrated below. The study highlights that most of the emerging technologies are still in their initial phase of innovation. Quite a few have reached the peak of hype cycle. While only 1 emerging technology, Virtual Reality, has reached on the slope of enlightenment to move further to the plateau of productivity. 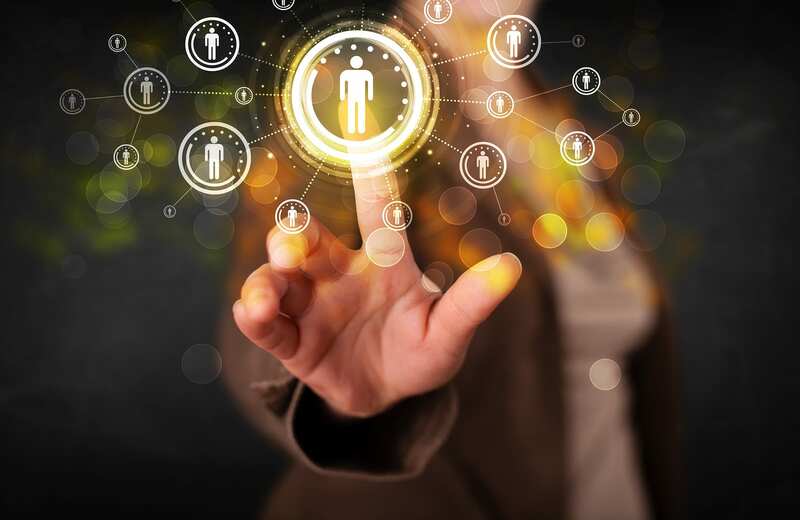 Blockchain technology, connected homes, machine learning are emerging technologies at the pinnacle of the hype cycle and the users of these technologies have inflated expectations about the benefits that these technologies can bring. Blockchain and connected homes still have 5-10 years of timeframe till they will be adopted in mainstream. Machine learning, on the other hand is expected to go mainstream in next 2-5 years. Virtual reality technology has seen movement from the trough of disillusionment in last year’s hype cycle to the slope of enlightenment in this year’s cycle, but is still 5-10 years away from going mainstream. Virtual Personal assistance ( like Siri, Cortana) were at the start of the curve in 2015 study, have started to climb the curve this year but are still in innovation stage and need 5-10 years to penetrate the market. 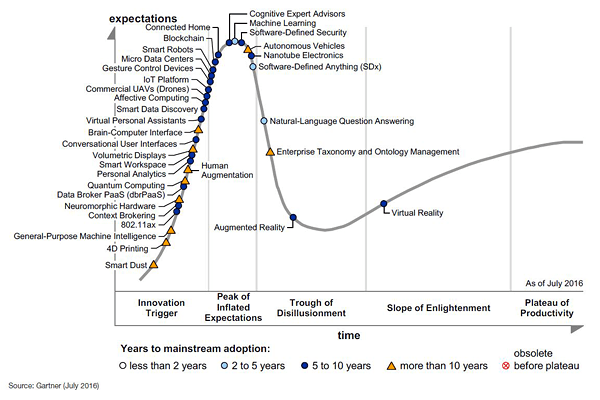 If you compare the 2016 Hype Cycle for Emerging Technologies with the 2015 hype cycle (as illustrated below), it is very clear that some technologies are missing from the curve. Well, Internet of Things, Speech to Speech translation, Wearables which were seen descending to the trough of disillusionment in Hype cycle 2015 are not any more a part of the Hype cycle. In fact, Internet of things and Wearable technology were estimated to go mainstream only after 5-10 years but suddenly they don’t exist. There could be two potential reasons for disappearance of these technologies from the curve. One being the technologies have succeeding in their breakthrough and hence have departed the curve, or the other reason could be that as per Gartner these technologies are not much-hyped anymore and have lost their buzz, dropping them off the Hype Cycle entirely. On the other hand, there are some new entrants in this year’s hype curve as compared to previous year’s curve. 4D printing, General Purpose Machine Intelligence have made their way just at the start of the curve. Deep learning, on a surprising note, is still not considered an emerging technology and is not a part of the curve. Autonomous vehicles continue to remain in the peak of hype phase, however it is moving towards the valley of disappointments in the current cycle. Gartner, however has increased the time frame that would be needed by autonomous vehicles to become mainstream from last year’s 5-10 years to more than 10 years in 2016 hype cycle. Google’s self-driving car is one of the most talked about and with advances in technology, autonomous cars are more likely in the future. But the reason for change in the time frame is most likely due to high complexity involved in these vehicles and high development costs. If we look back on all the previous Hype Cycles, it is remarkable how accurately Gartner has managed to classify many technologies and predict their time-frame to go mainstream. One such instance is of tablet computer. 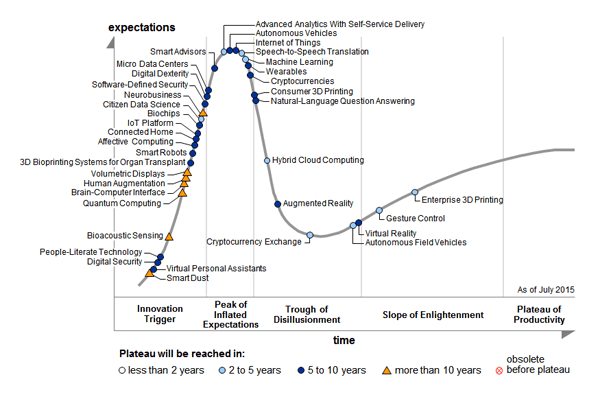 In 2005 hype cycle, tablet computer was placed in the Trough of Disillusionment phase with a prediction of 5-10 years for it to make it to mainstream. True to Gartner’s prediction, iPad was launched by Apple in the year 2010 making tablet computers self-evident. At that point it left the Hype Cycle entirely.